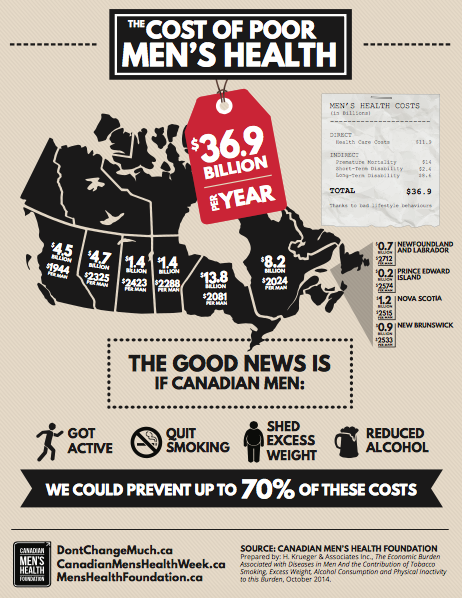 A study commissioned by the Canadian Men’s Health Foundation (CMHF) has found that poor health among men costs Canada $36.9 billion a year. Smoking, excess weight, smoking and over-consumption of alcohol are all factors that lead to disease and illness, which are linked to treatment costs. The study was released on June 15, the same day Men’s Health Week is kicking off, in hopes of raising awareness on the issue and encourage those living with unhealthy lifestyles to take action. The breakdown states that $13 billion was directed to smoking problems, while $11.9 billion went to excess weight and $7.6 billion to alcohol. Ontario accounted for the lions share of the costs – an estimated $13.8 billion. B.C. recorded a total of $4.5 billion of the cost. A report summary released by the Men’s Health Foundation said that 70 per cent of these costs could be prevented if men took immediate steps to lead a better lifestyle.